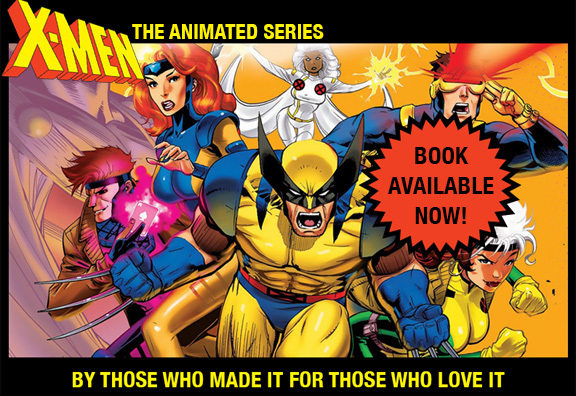 X-Men: The Animated Series – Page 2 – Celebrating the series with behind-the-scenes content never seen before! On January 9, 1993, 25 years ago this month, X-MEN:The Animated Series officially premiered on the Fox Network (after a few sneak screenings the previous fall). This January we start what we hope will be a satisfying year travelling to Cons and other events to celebrate the experience and the recent publishing of our book. We’ll be in Pasadena, CA, at their Con this month (Jan 28) and in Knoxville, Tennessee next month (Feb 15), at an event sponsored by the University. Later Con trips are set for Anaheim, CA, (late March), San Jose, CA, (April), Atlanta, GA (May) Denver (June), Toronto (summer), with more to come later in the year (like Grand Rapids, MI, in November). Below is our first shot at a 6′ x 3′ Con banner for our table. Please come by and say hello if we are in your area. Wish us luck. Yes, that is Canada’s Prime Minister, Justin Trudeau, accepting his author-signed copy of PREVIOUSLY ON X-MEN from Wolverine (Cal Dodd, far left) and Jubilee (Alyson Court front, center) today. I am told he loves the show. And since the entire cast is Canadian, we felt is was appropriate that the self-proclaimed “comics geek” leader of that great country got the very first copy printed. We hope he enjoys reading it during his copious spare time — and that he recovers from shaking Wolverine’s hand (see below). Finally — nearly three years after we started, PREVIOUSLY ON X-MEN is here. It’s real. Jacobs/Brown did a fabulous job, and I’m bleary from signing 208 of them. This first print run is only 1000 copies, and about 240 have already been ordered or are spoken for. There will be more hardcover printings, and runs of trade-paperbacks, and a Kindle version (check Amazon later in the month) — but if anyone wants to make sure of having a signed hardcover copy before Christmas, you should grab one of these at the website (jacobsbrownmediagroup.com) before they are gone. For those of you who have placed orders, I’m told Jacobs/Brown will start shipping them (book rate — takes about a week) on Saturday (11/11). Book Available to Order Now! !